Fast, easy, and perfect for nights when you're just too lazy to do two proper cleanses. The cleansing cloth. The Facial Cleansing Wipes are pre-moistened with an alcohol-free formula enriched with edelweiss extract. They don't feel overly wet, but do have enough solution to remove makeup pretty well. The texture helps to lightly exfoliate and grab makeup, dirt, and all the bits you want gone. While I like these for removing makeup, the scent is a bit much for my taste (it's fairly strong) and as such I won't use these on my eyes. Oaky, a slight delineation from the cleanser party with the Daily Refining Scrub, but it actually doubles as a cleanser too, so not quite...? Anyway, the scrub is fairly gentle, and most skin types will be able to use it daily without issue. It has a light scrubbiness, but works nicely to exfoliate skin, remove leftover makeup, dirt, and oil and doesn't leave my drier skin feeling tight or drier than pre-scrub. Onto the cleansers. 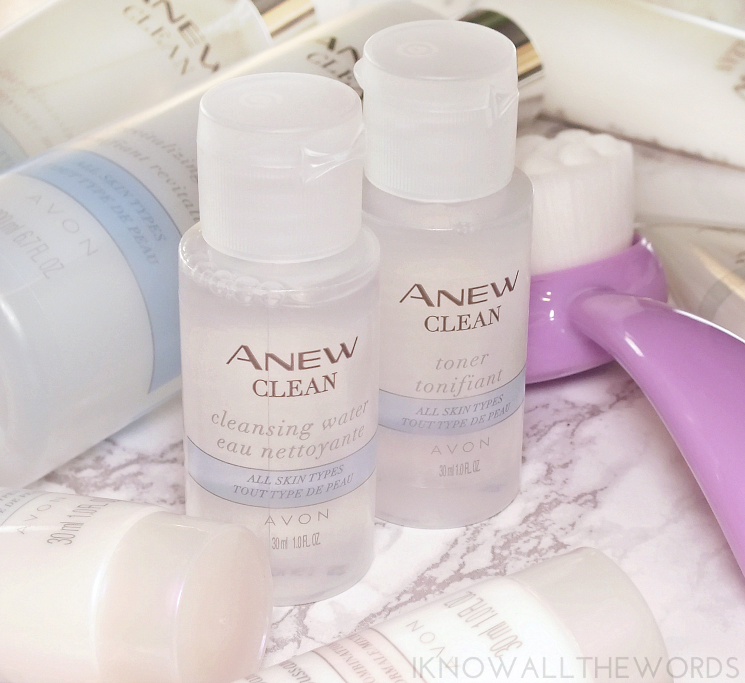 Anew Clean is offering up something for every skin type and is making the decision process a bit easier by offering mini size as well. The minis are perfect options to try a few formulas or to have on hand for travel, while the biggies (aka full size) are great if you know which one is right for you from the start. Rich Cleansing Foam is best suited for normal/combination skin and works to balance skin while removing oil without stripping moisture. Gel Cleanser is best for oily/combination skin as it works to eliminate excess oil and keep skin shine-free. Cream Cleanser & Mask is best dry/normal faces as it restores moisture to dry skin. It works nicely as a cream cleanser, and can be applied as a moisture mask for added hydration when needed. What is a cleansing post without a micellar? Kind of depressing, that's what. Avon is in the micellar game now! I was excited to see how it would hold up to my favourites. The first use was kind of disastrous, but I've learned my lesson- DON'T USE IT ON YOUR EYES! Caps are most definitely necessary here as this will sting the shh... sugar out of your eyes. I was ready to toss the bottle but there is a very good explanation for the pain I suffered. That reason? Hyaluronic acid. This micealler does a great job at removing makeup and helping skin retain moisture and in this case, makes the product you use after it more effective. Just don't use it on your eyes. The micealler does have a bit of a slimy feel, that I initially hated, but it doesn't last on skin. Once dry skin feels fully cleansed, smooth, and without any dryness or tightness. Wrapping up your cleansing session with a toner is just what you do. The Revitalizing Toner does the job well. It's formulated for all skin types, is alcohol and oil-free and leaves skin feeling lightly hydrated, smooth, and has no sticky or greasy feel. I find it's hard to judge toners, as they're either terrible or great with little room between, so I'd label this one as pretty great. Both the Micellar Cleansing Water and Revitalizing Toner are available as minis for your testing or traveling pleasure. How cute is the Deluxe Cleansing Brush?! Fancier, mechanical cleansing brushes are great (you know I love a bit of beauty gadgetry) but sometime a more low-tech option is nice too. This cute little purple handled brush has the softest bristles that are gentle on all skin types and work very nicely with your cleanser of choice. It massages skin and cleanser for a full clean and is easy to rinse out for the next use. Overall, I am pretty happy with the range. 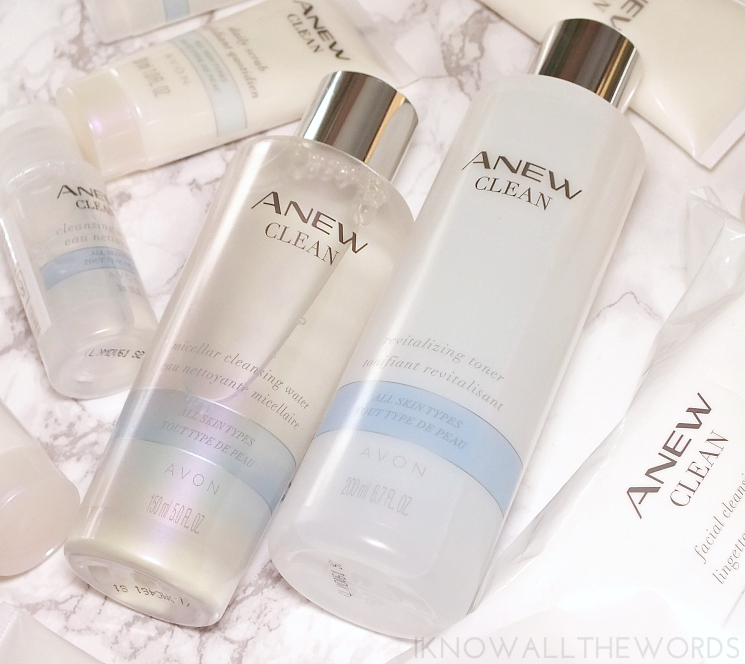 Not all of the cleansers are a fit for my skin type, but that,s life. I love that they've offered cleansing options and minis. More brands need to embrace the mini. What do you think, could you use any of these products in your routine?